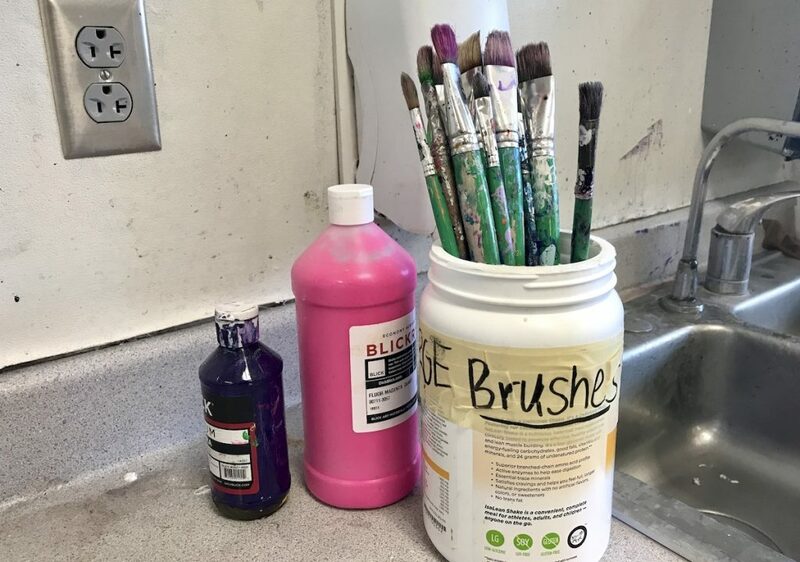 Using recycled containers in your art room can be a lifesaver. They’re free and can be used in a variety of ways. Protein powder containers are one of my favorite kinds to use. If you’re not a protein fiend yourself, send out an email to your friends, family, or colleagues to see if any of them are. Trust me; these containers are the best! If you can’t find them, consider looking for similarly sized and shaped containers like trail mix or other snack containers at big box stores. 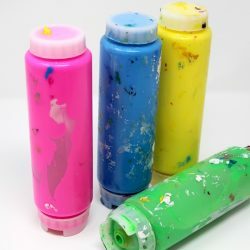 Check out 5 ways you can reuse these large containers in your art room. 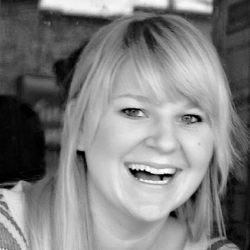 Do you need help managing your clay procedures? 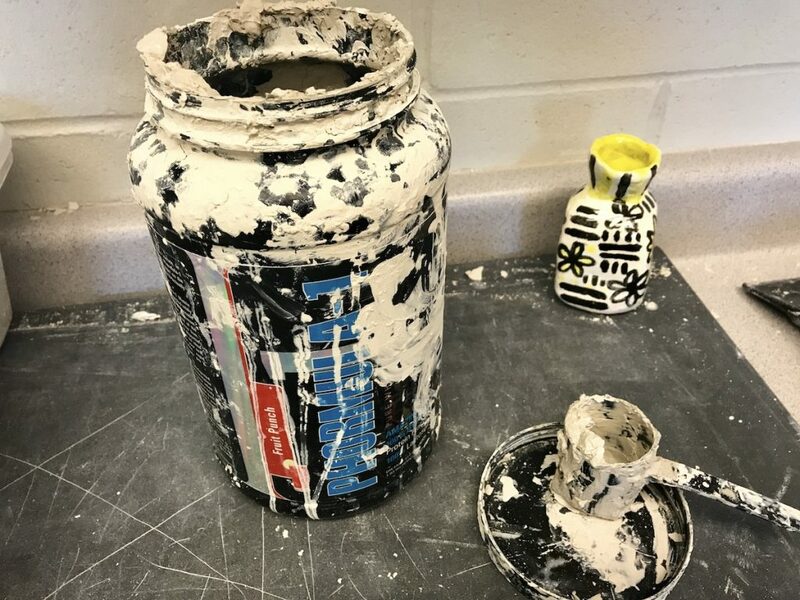 Utilizing a protein canister to hold slip works wonders when working with clay. Mix up your slip and store it tightly using the lid. Students can easily put slip into their slip cups by using the protein powder scoop. This is an excellent way to control the amount of slip for each student. Sometimes after many uses, clay can start to build up on the scoop. To decrease this buildup keep a rag or paper towel nearby for students to wipe off the scoop. These containers work great to store your taller paintbrushes. They are stable enough that your brushes won’t make the container tip over. Don’t forget to cut a little hole in the bottom so the water from the wet brushes can drain out. Sometimes our students can’t help getting messy. Why is it so difficult to throw things away? We’ll probably never know the answer, but using a large protein container at each table to serve as a mini trash can will help manage the mess. Whether students are sharpening pencils or carving into a linoleum block, they can use these containers to clean up their messes as they work. The art room is a perfect place to reuse plastic grocery bags. Your supply of bags can build up quickly and a large bag stuffed with more bags isn’t always the most efficient way to store them. 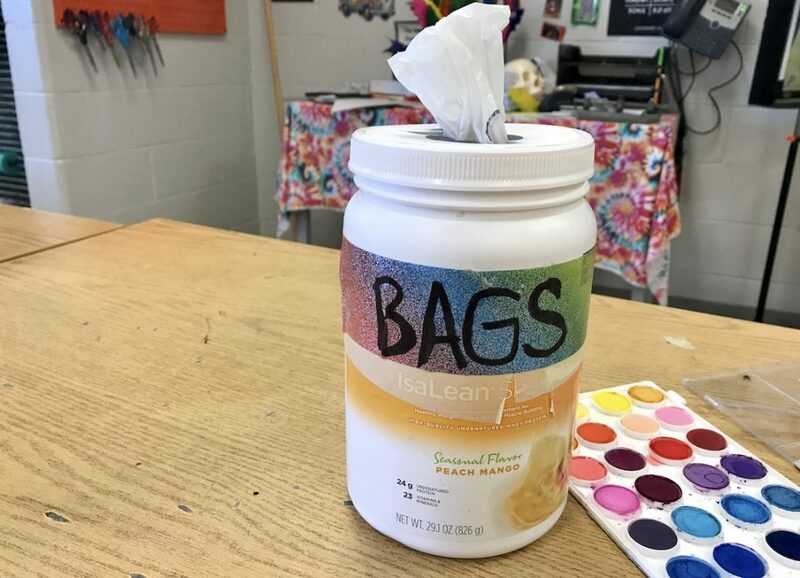 Try using a large container as a bag dispenser. Simply cut a hole in the lid and stuff the bags inside. You can have several bag dispensers throughout the room for easy access. 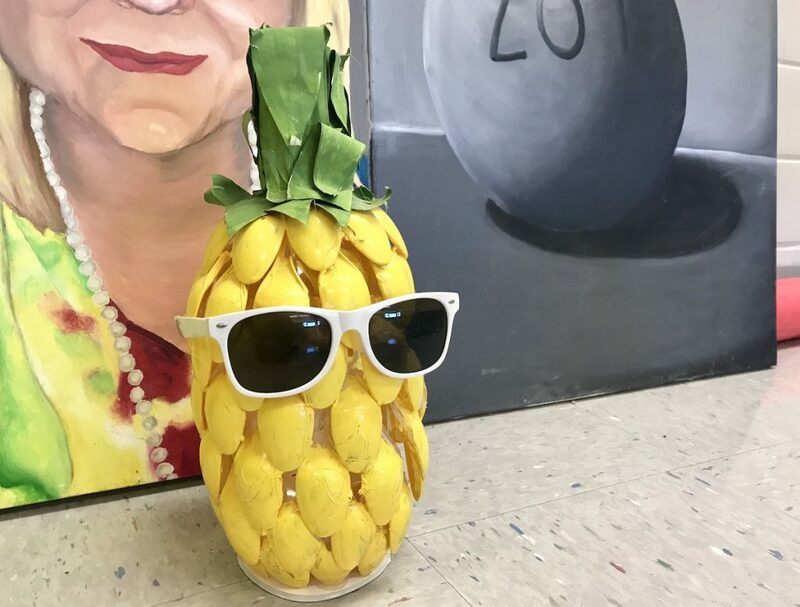 Using recycled materials to create sculptures is a staple in most art classes. Those big containers work well to begin an armature or base for a sculpture. It can help stabilize a form without wasting a lot of other materials. Take a look at the example above; the protein container is used in the center to serve as a foundation for the sculpture. 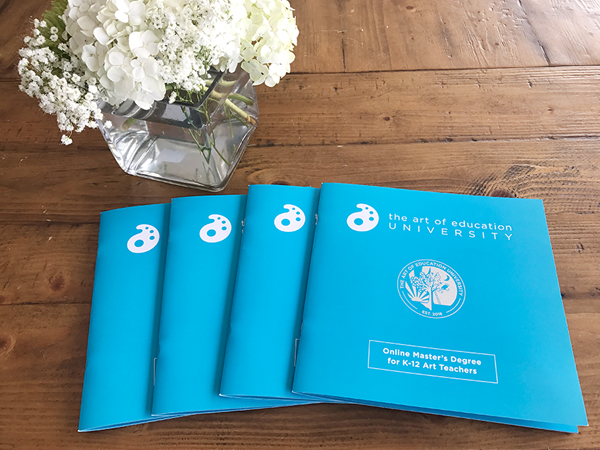 Finding cost-effective ways to store and organize materials in the art room is essential. 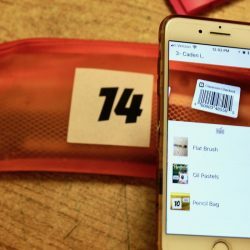 Sometimes it takes a little time to collect the items you need, but they can effectively help you manage your classroom. If you’ve struggled to find the perfect item to help you organize, start making some protein smoothies now! What are your favorite recyclable materials to use for organization in the art room? How else could you use containers like these? I too use protein power tubs but not as much. I use the big plastic coffee tubs for clay and slip as well as yogurt and cottage cheese containers for markers and colored pencils. So glad you wrote this article!! I’ve been struggling with what to do with all my Isa protein containers! I hated putting them into the recycling bin every week but I also hated how much space they were taking up in my pantry! Haha! Thank you! ? I love the idea of using the container for bags. I use the tubs from frosting to hold colored pencils and markers.I also use fruit and applesauce cups for water and paint.